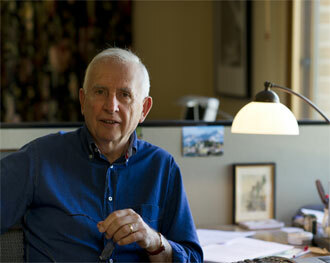 Hugh Mackay is a social researcher and the author of 16 books, including The Good Life, a 2013 bestseller, and his sixth novel, Infidelity. He is a Fellow of the Australian Psychological Society and the recipient of several honorary doctorates from Australian universities. He lives in the Southern Highlands of New South Wales. The most recent "good" book I've read was Hallucinations by Oliver Sacks (who is, sadly, no longer with us). It's a rivetting account of the personal, social and cultural effects of hallucinations of all kinds. I have drawn on some of Sacks's case-study material in my new book, Beyond Belief (out next year). I love libraries, fullstop. My love of libraries began in primary school and deepened when I was a schoolboy librarian at Sydney Grammar and spent all my spare time there. It became my my cocoon, my eyrie. I have observed with great interest and pleasure the radical transformation of local libraries from places to read in, and borrow books from, to vibrant community hubs offering a place for people to meet, socialise, be stimulated, become better informed (and not just from books), and exchange ideas. A neighbourhood without a library is a poor neighbourhood, indeed. I have dealt with the changing - and crucial - role of libraries in my most recent book, The Art of Belonging (2014). My latest novel, Infidelity (2013), was described in a review as an anti-abortion tract. The reviewer was either lazy, careless or wilfully mischievous, as anyone who's read the novel would know. There's a big difference between being "anti-abortion" (which I am not, and neither is the novel) and acknowledging that in cases where the partners disagree about whether or not to terminate a pregnancy, termination can have a devastating impact on their relationship. Remember there are two sides to every story - and often, I've since realised, more than two. What drew you to the subject matter of The Good Life? That book grew out of my realisation that Australians were under bombardment from propaganda coming from two quite different directions - the merchants of materialism and the merchants of happiness. Both were fuelling the idea that "It's all about Me". I thought it was time to remind ourselves that we are by nature social creatures who depend on communities to sustain and protect us, and that those communities, in turn, depend on our willingness to treat each other with respect and kindess. In other words: treat other people the way you'd like to be treated. We know that's the best "rule" of all, for harmonious and productive living, but we easily lose sight of it. We can also lose sight of the fact that life's deepest satisfactions come from a sense of meaning and purpose, not from any emotional state, including happiness. All our emotions are authentic, and they all have something to teach us about what it means to be human. So that's why I wrote The Good Life - it was an attempt to remind us what "good" really means, and what a life characterised by goodness would look like. Want to know more about The Art of Belonging? In his bestselling book, The Good Life, Hugh Mackay argued that kindness and respect for others are te hallmarks of a life well lived. 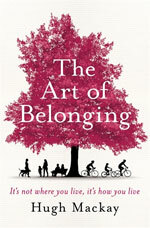 Now in The Art of Belonging Mackay shows how strong communities develop develop our moral sense and build our emotional security. He says that as 'social creatues' we can only reach our potential when we engage with our communities - in the local neighbourhood, at work and even online.